As part of our Christmas vacation trip back and forth to upstate New York, we built in a two and a half hour visit to the Rock and Roll Hall of Fame in Cleveland, Ohio. I've been wanting to get to this place for a number of years, so when my wife mentioned it as a possibility a few months back, I thought it was a great idea. And, frankly, it was a side trip that almost didn't happen. After all the battles with snowy road conditions and the busy-ness of the holidays, we were all feeling the pull of home strongly by the time the end of our stay rolled around. At the last minute, we decided to stick with our original plan and go see the museum. For those of you considering it, I would say that you should allow at least 2.5 - 3 hours to see it all, more if possible. There is so much to see, especially if you are a rock aficionado. We started at the top floor where there was an exhibit recognizing the 50 years of Rolling Stone magazine. While I realize that this magazine is much more corporately slick than it was when it started, there were some cool exhibits. As a writer, I can appreciate all that goes into the making of a magazine like this, especially the interviews. Because of this, some of the things that stood out for me were writing related. 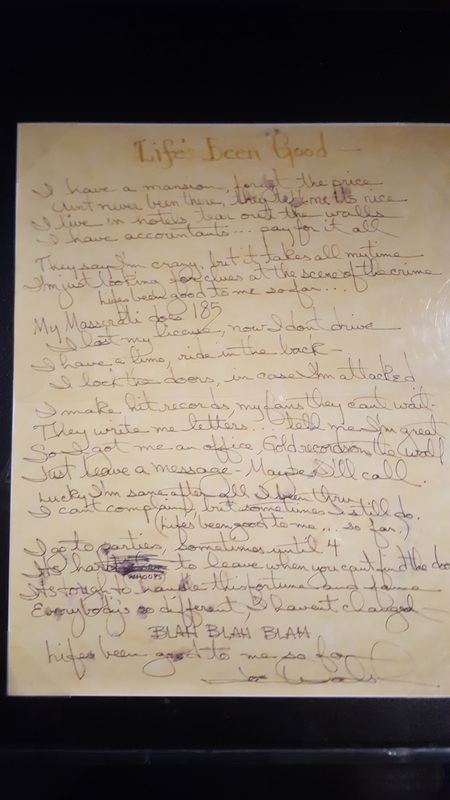 Three in particular were letters to Rolling Stone, one by Paul McCartney, one by Hunter S. Thompson who used to write a column for RS, and one from Charles Manson. The one from Manson was questioning some of the points that the interview with him emphasized. It was creepy weird, but cool that things like this are preserved. 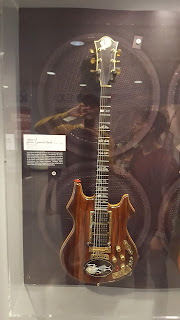 Of course there were lots of famous guitars and other instruments too. Everything from the acoustics of the old blues masters, to the square electric of Bo Diddley, to the ornate piece of artwork that Jerry Garcia had custom made for his years with the Grateful Dead. It is almost a bit tragic knowing that these instruments that brought such beauty to the world are now silent. At the same time they evoke great memories from everyone that sees them. There were even a couple of smashed guitars that didn't make it past the moment of rock rage. 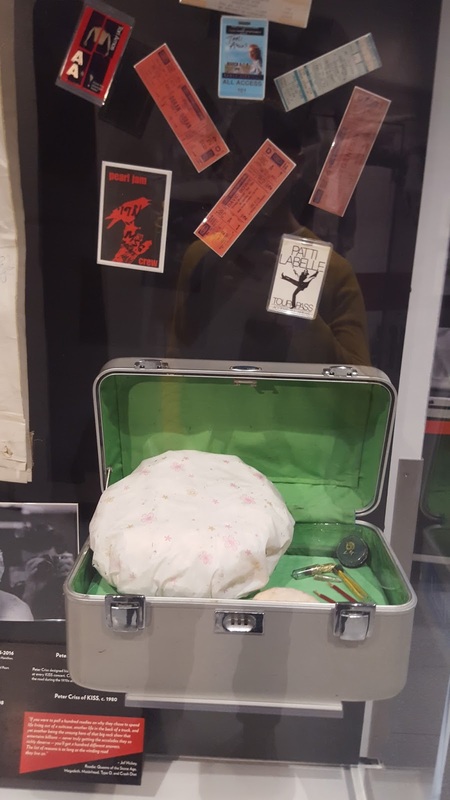 Peter Criss' makeup kit. He was the drummer for KISS a band whose music built around their garish makeup and costuming. I was never a fan of them, but I can appreciate this piece of history. Pre-concert contract agreement for the Replacements including the venue providing 2 cases of Heineken beer backstage before the show. 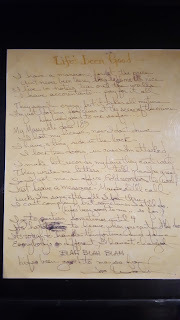 The lyrics to Joe Walsh's song, Life's Been Good, in his own handwriting. Same for Warren Zevon (Play It All Night Long) and The Clash (London Calling). One of the dresses worn by Deborah Harry of Blondie. And after spending 2017 chasing the aging rock stars like Stevie Nicks, The Church and Roger Waters, this cruise through the Hall meant a lot to me. And with two of the 2018 inductees, (The Cars and Dire Straits) being among groups I count among my favorite of all time, the trip seemed even more like a pilgrimage. 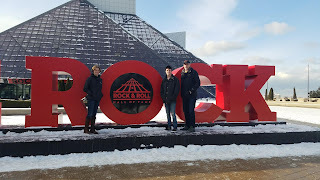 Now, I realize the Rock and Roll Hall of Fame is a touristy, kitschy, pop culture wasteland to most people. And there are many that will claim that the HOF is a sham because of who ISN'T in it. (For me that band is the J Geils Band). But for me, it was a walk down memory lane. I am a music lover and could spend all day there, if given the chance. Like it or hate it, Rock and Roll has brought a lot to the world. And this gives you a glimpse into much of it.